Bekki and I in front of the Adventist Health System, Waterloo Hospital. They are not subtle around here, he, the nurse, emphasized the immediately part. So I got dressed, grabbed my office key, headlights and stethoscope and headed to the hospital, all of 50 feet away. I made my way through the women’s ward into the men’s ward where I spied the telltale group of people huddled around a bed. I figured that had to be the patient in need. I found a young man, late teens, early 20’s lying quietly on his side, with a large distended abdomen. I asked the usual questions, when did he come? How long has he been sick? What are his symptoms? The questions are asked in a somewhat hopeful manner, as often the answers make no sense whatsoever. A patient with something that clearly has been going on for some time allegedly became ill just yesterday, or I will get the history that he has been vomiting, two minutes later I am told he never vomited, five minutes after that the story is he vomited a little, take your pick. Well for this young man the story fit, he was fine until this morning, fairly sudden onset of illness, complaining of abdominal pain, nausea, vomiting and not going to the bathroom. On physical he looked sick, (a very important sign), was quiet, tachycardic (fast pulse) and his pulse was weak. His abdomen was distended, and very tender. I couldn’t find any hernias. Otherwise he was normal. My diagnosis was peritonitis, maybe an internal hernia with a bowel obstruction, a torsion of his intestines, or a perforation of something that shouldn’t have a hole in it. Whatever it was, he needed surgery. Soon. Of course after some IV fluids and antibiotics. So I evaluated my resources. OR crew, all at home asleep, and I had no way to reach them. Laparotomy pack, I had looked at it, I could work with it, but hopefully it would not be anything difficult. OR lights, it is tough enough to do a hernia in the dark, but a laparotomy, on a dark skinned patient? I don’t think so. OR electricity, non-existent at this time of day, or night, and no way that I know of to get the generator on. For those of you wondering why I didn’t have many of these things already worked out, for instance knowing how to reach the OR crew, or who to contact to start the generator, the last reason will explain it. Anesthesia, I a.) don’t know how to get ahold of him and b.) would not dream of trying to do a major elective laparotomy with him with him during the day, let alone an unknown emergency laparotomy during the night. The lights look better in the picture than in real life. The spot light does a good job showing my hand which is keeping it from shining on the patient. I had already decided that we are not anywhere near ready to do major cases, let alone major emergency cases. I have visited several hospitals out in the provinces here (rural) and they are at a more advanced level than we are. 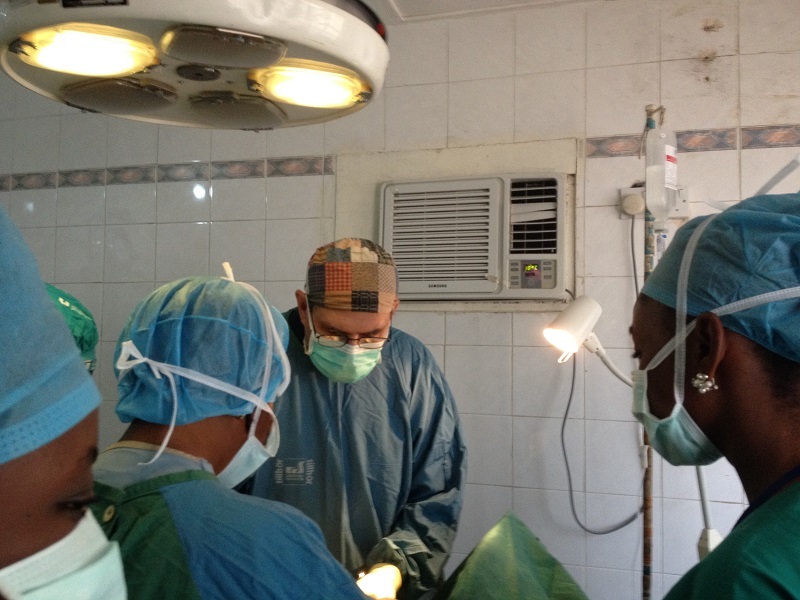 The standard of care here in Sierra Leone is higher than we can achieve in the OR. And that is not a knock on the OR staff or anesthesia nurse. They have never had the opportunity to be trained, and they are working without adequate resources. Surgery here is a group effort, everyone is involved. 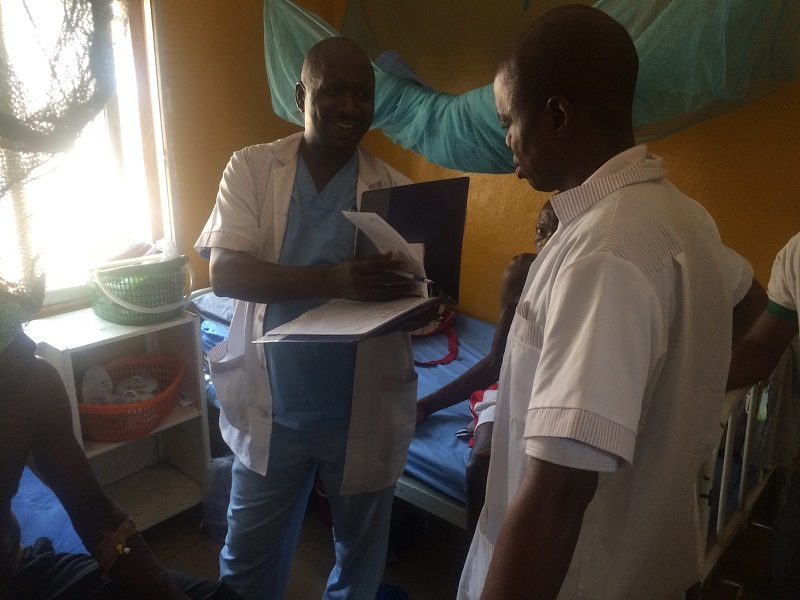 For instance my anesthetist is a ward nurse who was pulled into the OR and given training by Dr. Koroma who is a General Medical Officer (and a very very good one), which is basically a PA. Thursday I had to teach Ibrahim what a jaw thrust is and how to do it. He faithfully takes vital signs and pushes the ketamine and diazepam as I tell him to, but I really doubt he would recognize a problem or know how to deal with it. Again, not his fault that he has had no opportunity for adequate training. And no knock on Dr. Koroma who has done a fantastic job with nothing (quite literally). Back to our emergency case. I am not going to do some heroic operation that will probably end up with me slicing my finger with the knife and the patient dead when there are perfectly good hospitals in Freetown an hour and a half away. I told the family he needed emergency surgery beyond our capabilities and he needed to go to Freetown to the Government Hospital. I asked the nurse if we could call an ambulance to come get the patient and take him into the city. I hear government ambulances going back and forth in front of our hospital all the time after all. I turned around to see a short stocky man, obviously a patient relative. Unfortunately it made sense so I headed back to the ward with him. I asked the nurse if I needed to call the ambulance. “Yes, it would be best if you called for the ambulance”, he told me. “OK, where is the government ambulance”, I asked. “Well, doc, a government hospital (actually just a health center) is right next door, but they don’t have an ambulance we can use”, he replied. “But we can call for a government ambulance, right?”, I queried. Again he assured me that we could call. Then I asked the $64,000 question. He smiled, and shook his head, “No”. Alright, we are getting somewhere, we have now eliminated the possibility of transferring the patient by ambulance. “So how do we get him to Freetown?”, the American asked. By now I knew to leave nothing to chance. I turned to the short guy who had brought me back. I stressed the importance of getting the patient to Freetown tonight and told the family we would give him 2 liters of IV fluid, antibiotics and pain medication while waiting for the car. As I walked toward the exit I heard the rain starting to pelt the roof of the hospital. The tropical shower felt good as I walked home with very conflicted feelings. I knew there was no way I could justify trying to do an operation we had no business doing and putting this boy’s life in jeopardy, but I also knew the stories I had heard of the government hospitals. I knew he might not see a doctor, let alone a surgeon until Monday. He would likely be dead by then. Since deciding to leave Tchad and come to Sierra Leone I have had a certain amount of guilt. I knew I was needed in Moundou, I knew I could have helped a lot of people that were going to suffer because I was not there. 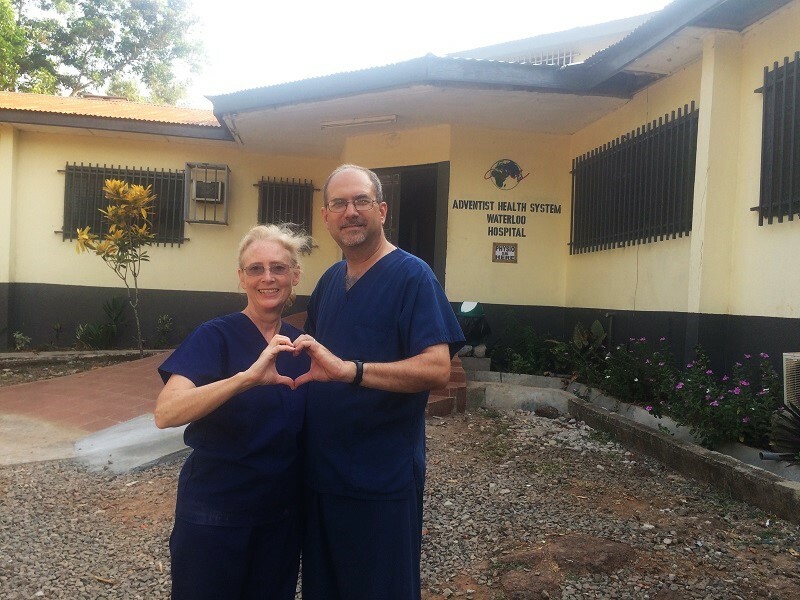 I soothed my conscience with the thought that people needed me in Sierra Leone too. As I crawled into bed, I realized it had not just been a rationalization, it was true. I am desperately needed here. We were not ready for this young man yet, and I am sorry for that, and it will take some months before we are up to speed to be able to handle most surgical cases that come through our door, elective and emergency. But by the grace of God, and with your help dear readers, in time this hospital will be ready for whatever presents itself. 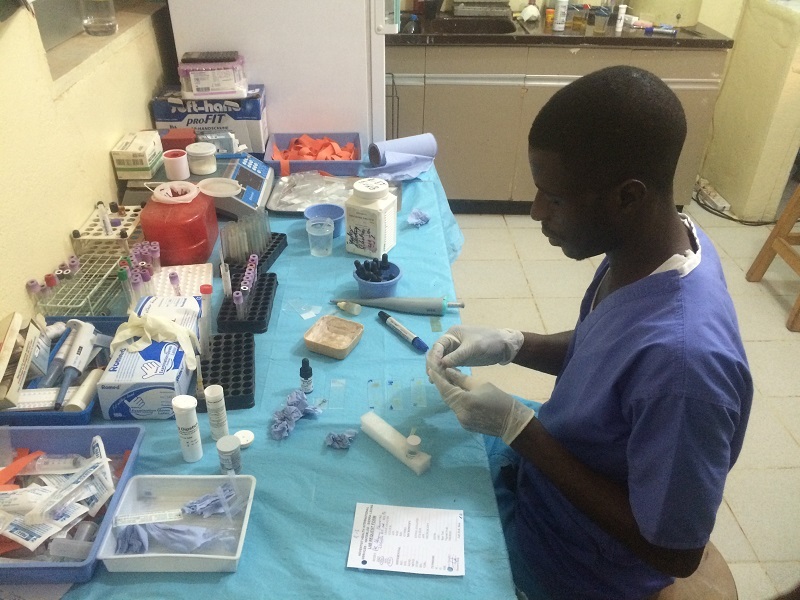 Dalton Kabbia is one of our lab techs. He is an Ebola survivor. His story is coming up next. Our first 2 weeks in Sierra Leone (derived from Portuguese for “Lioness Mountain”) are in the books, and as you can suspect it has been quite a time. Before we arrived we enjoyed three months of fantasy, dreaming of Sierra Leone as some type of “Fantasy Island” for those of you old enough to remember the old TV show. A country in West Africa with streets paved of gold with endless white sand beaches, where the missionaries enjoyed a little R&R sipping virgin daiquiris. We refused to listen to anyone who would try to wake us from our dream world, knowing that the awakening would come soon enough, April Fools day to be precise. And so the vision was snapped at 3:45 am, April 1 as our Air Maroc 737 touched down in Lungi, Sierra Leone. We had spent the last 3 hours listening to certifiably crazy woman on the plane, one who clearly forgot to take her medications the day or days before, and spent the whole flight shouting things that really can’t be put in a family blog such as this. She even rated her own personal security guard as the Sierra Leonean authorities attempted to get her through the airport as quickly as possible. Really the trip between Tchad and Sierra Leone could not have gone smoother or been better. We were able to see many of the people we love in Geneva and Collonges, and spend quality time with our closest friends. We had amazing dinners together, we went to museums together and just spent time talking in the living room. Grand Merci to all of you who made our time in Geneva and Collonges so special. But back to Sierra Leone, this may come as a surprise, but it really isn’t the paradise we had fantasized about. Reality is that we are still in West Africa, which is in Africa, which is in a sinful world, so that should explain a lot. But I thought I would borrow from an old movie title and write what we have found to be the good, the bad, and the ugly. The reception we have received from everyone here. All the staff are so happy to have us here, the mission president and mission staff, patients. Our welcome could not have been warmer. We have felt loved and accepted from the get go. And everyone has done all they could to make us as comfortable and happy as possible. The roads. Wow, the main routes are all paved, and really well, very few pot holes, and although still two lane, they have shoulders, they are a full two lanes, they have barricades on the sides of cliffs, they have pullouts with concrete picnic tables overlooking scenic spots. 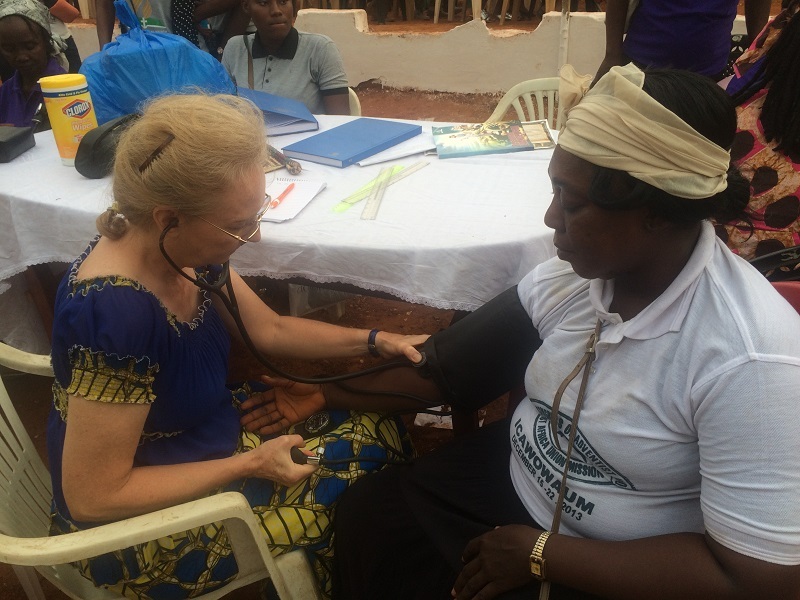 Bekki doing blood pressure checks at the Evangelistic Crusade just outside Waterloo. The hospital physical plant. 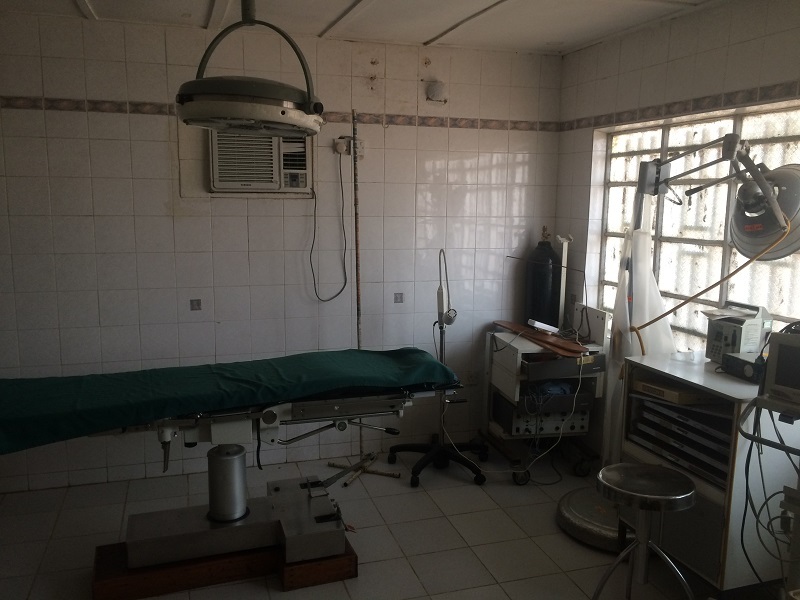 It is really nice, painted, all tiled, matching beds with mattresses and sheets, a mosquito net to each bed, a real scrub sink in the OR. There are real offices with computers, air conditioners and fans. My office has it’s own AC and a fan and a sink and a nice exam table with a curtain for privacy. It is pretty fancy and upscale for what I am used to. The Food. The vegetable and fruit markets are full, with great produce. And this is the end of dry season, so it is the worst time of year to get veggies. They have peanuts, and although not on par with Tchadien peanuts they are still pretty good. But the cashews, oh my, they are everywhere, bags of roasted cashews that are so very good. There is also this bread, topaloppa, that is also available everywhere that tastes like the breadsticks in Bongor, only better. And popcorn is everywhere, both savory and sweet. Yesterday in Freetown we tried out several items from street vendors, sweet breads, popcorn, nuts. All good. The Shopping. Just 25 minutes from us is a modern air conditioned supermarket that has just about everything we will need. Bekki was busy marking off item after item of “things I need to bring back from the US”. No need now because it is here. 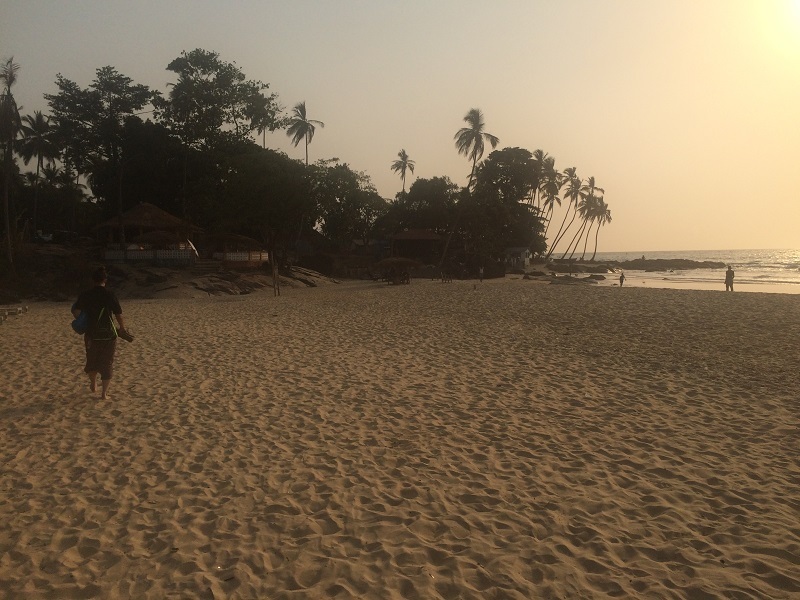 Freetown is only 75 minutes away and has pretty much anything we would need. And of course there is always the crazy, crowded, wild, dizzying, street markets. Bekki and Erin Acosta heading into the chaos of the Waterloo vegetable market. The Climate. It is hot season, so if you stand out in the full sun you will sweat. But there is often a gentle cool ocean breeze, even here in Waterloo. And it is very comfortable in the shade. Toward evening it cools down and is very pleasant outside. It reminds me very much of Hawaii. The Beaches. Yea, you knew that was coming, especially those of you who are facebook friends. The beaches did not disappoint. They are only 20 minutes away, and are awesome. Clean, gorgeous sand with palm trees, and warm ocean water, waves to body surf on and pools to soak in. The terrain on the peninsula where we are is hilly, so very pleasant to look at, with green all around. I could live here. Oh, wait, I do! Current Housing. We are in a guest house with two small studio apartments. Erin Acosta a MPH student from Loma Linda University is in one, we are in another. It is small, but very functional and comfortable. It is air conditioned during the day, and cool enough at night to be comfortable. We have a stove and fridge, so I am able to enjoy Bekki’s home cooking. As good as Dina was, I still would take Bekki’s food any day of the week, except pizza day. Front of our new house. Future Housing. Too bad the movie wasn’t The Amazing, The Good, Bad and Ugly. The house they are preparing for us just may convince us to stay for a very long time. It is beautiful, big, with lots of windows, airy. I can’t wait to see how Bekki gets it fixed up. There are three bedrooms so lots of room for visitors (hint, hint). The Roads. Once you get off the paved roads, oh my. Other than the width of the road, I have been on advanced dirt bike trails that were better than these. Sierra Leone is blessed with lots of rock, which is why their paved roads are so good and the dirt roads are…well they stink. 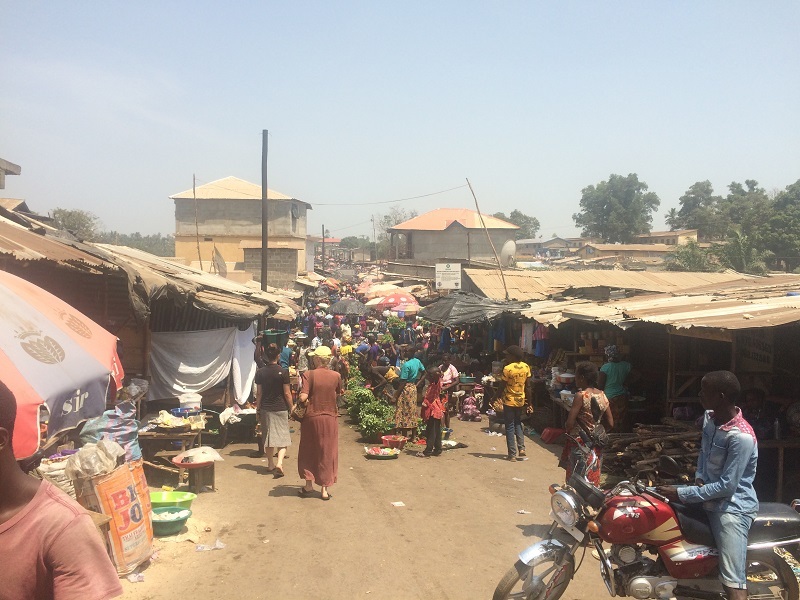 The Traffic in Freetown. It will be some time before I have the nerve to drive in the nightmare they call Freetown. There is nothing “free” about it. Traffic there is best described as one big traffic jam. Not even cities in India come anywhere close. It must be experienced to be believed and understood. The only good news is that no one is moving fast enough to have anything more serious than a fender bender. The Electricity. Now that we have learned to deal with it, it could go into the “Not good, but not too bad” category (same with water, see below). State power (NP) is about like it was in Moundou, a few hours a week, and very sporadic, no schedule. The hospital has some big (150 KVA) generators, which they run during the day for about 6-7 hours. And during that time we have AC in the apartment, and really good power. In the evening Erin and we have to share a 5 KVA generator. At night we have no power outside our small goal zero battery. But we have learned to adapt and it is going OK. The Water. So this is the end of dry season, which means the water table is at it’s lowest. We have a solar pump which is supposed to fill the water tanks during the day. But reality is we have water that trickles out every other day. Whether the solar pump is really too weak, or the water table is just too low, we will find out when the rains come. For now we have learned to conserve. Fortunately not too far away is another well with a hand pump, and I now have a key. So we have 20 gallons of water sitting in our bathroom in various containers. We are ready for Sabbath, it was just like picking up the manna for the Children of Israel, on Friday you get a double portion. As I was pumping the water out and hauling buckets I was thinking I could even have put water in the good section as I am finally getting some exercise. Clothes. I have to wear them. Yep, my days of scrubs and flip-flops are over. They wear real clothes here, shirts, pants, shoes and socks. The first day on rounds, I was pretty under-dressed, kind of like your worst fashion nightmare. So now I dress appropriately. Fortunately it is cool enough here that it is bearable. The Language. Yea they speak in English, but I understand African French as well as I understand their English. (European French is much easier to speak and understand.) They actually speak a combination of English and Krio, which is to English what Creole is to French in Haiti. So we will work on learning Krio, and already we are understanding the English here much better. The theatre, or Operating Room, or Bloc Operatoire, pretty bare, lights don’t work, table doesn’t work, no suction, no cautery. But by God’s grace we do surgery anyway. The Theatre. For those of you not familiar with British terms, you will learn, as Sierra Leone was a British Colony. The theatre is the OR, or Bloc in French. The theatre here is exactly what I expected, functional, but barely. They have 5 autoclaves, 2 are broken, 2 are 110 with no transformer, and they do all the sterilizing in one small dental desktop autoclave. Which means it is in constant use. The OR lights that work all need new bulbs, the suction is very weak, and there is no cautery. The instruments are all very old, worn out and used up. And yet they keep plugging away doing cases, mostly hernias and appendectomies, but still operating. It is going to take a lot of work and a lot of prayer. I can’t come up with anything for this category. The people here are too beautiful, the scenery, the countryside, it is really a great place to live. Even after the devastation of the civil war, followed by Ebola they are so optimistic. And the leadership here thinks into the future, they have plans, they have dreams and they do what they can to fulfill them. They have an incredible faith in God and His power, even after all they have suffered. 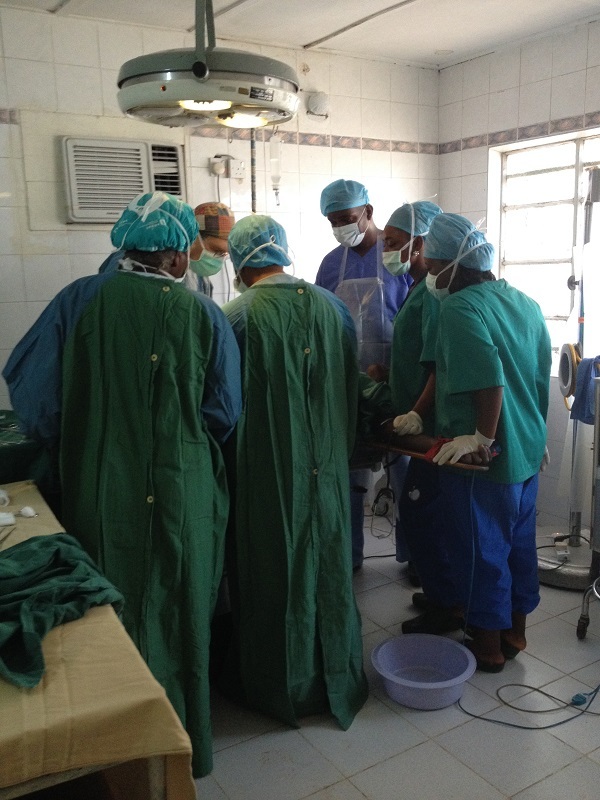 Dr. Koroma and Mr. James Abu on rounds. But we have our work cut out for us. As do you, dear readers, we need equipment, funds, and volunteers. 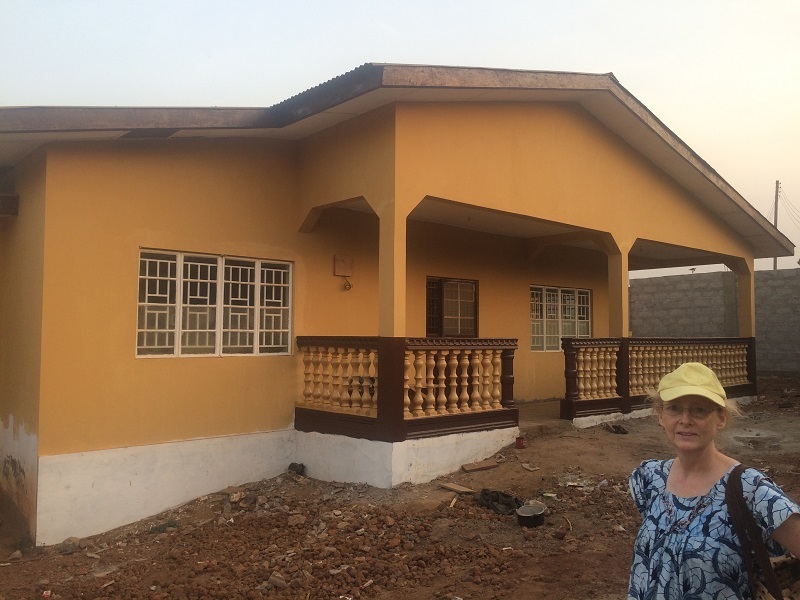 As God opens doors and windows and opportunities we (the whole team here) are going to, by His grace, get this hospital fully functional and providing a full service for the people here in Waterloo, Sierra Leone. For those of you new to our blog please look around at the other pages, the “About” page tells a bit of who we are and our background, the “Definitions” page explains some terms that are used that some of you may not be familiar with, such as GC or AHI. The “Timeline” gives an idea of where we will be throughout the year, and the “Video” page has a video Bekki made of Koza Hospital as well as the videos she has made of Moundou, and soon there will be a video of Waterloo. There is also the Surgical Pictures Page, but be forewarned, it has some very graphic pictures, so if you don’t like blood and guts, stay away from that page. You will also find links to other missionary blogs such as Olen and Danae Netteburg and others. Finally, if you like our blog and want to receive each new post directly to your e-mail, please sign up with your e-mail in the subscribe box. It doesn’t cost anything, there is no commitment, it just makes it easier to follow us. As we bid our final farewells to Tchad I thought I would just put down on paper some of the unusual things we learned about our life there. It is mostly tongue in cheek and much of it is applicable to all of Africa, but Tchad has some unique things as well. Some will make sense only to medical providers, but many things everyone will understand. Hope you get a chuckle out of it. The next blog will be our first from Sierra Leone. Left on red is legal, what am I saying? Anything on red is legal. You realize there are no traffic laws, only traffic suggestions. You have ever passed a moto who was passing a bicycle, who was passing another bicycle, on a 2 lane major highway. The potholes are so big and numerous as to be considered sink holes anywhere else. breath taking speed of 40 mph (60 kph). You have to share the major super highway in the country, with buses, trucks, cars, as well as pedestrians, wheel barrows, ox carts, motos, cows, camels, donkeys, dogs, children and anything else that walks, crawls or rolls. You realize that everyone else believes that lights on vehicles at night, and reflector strips on people and carts are way overrated, and you are just being whiny when you complain that no one has them. Driving is truly like being in your very own video game, but without do-overs. You start every trip with a really really sincere prayer for God’s protection. You have ever used sterilized fishing line as suture. You have ever used sterilized mosquito net as mesh for a hernia repair. You routinely operate with bare feet in flip flops. You consider it normal to operate on plastic cases with the orthopedic instruments, and orthopedic cases with the plastic instruments. In the box of instruments sent to you from America you find an arterial clamp labeled, “Broken, send to Africa”. In a container shipped to Africa in 2012 you find foley catheters manufactured in 1981. You daily do cases you have no training for. Your operative field moves more than a fishing boat in a typhoon. You start every case knowing that something will break, be missing, or quit working during the operation, you just don’t know what combination of the above. You realize that lab tests are way overrated, just let the kidneys sort it all out. You have a vague memory that potassium has something to do with the heart, I think. The heart? Oh yea the muscle that pumps quinine to all the other organs. In your dreams you hear the dwindling beep beep of the O2 monitor as someone is dying outside your office door. Best practice is what gets you and your patients through the day alive. You watch reruns of MASH, not for diversion, but for medical education, we are about 1952 medicine, right? Your patient is sweating and clenching their fists, but not making a sound and not moving as you rinse out their broken leg without anesthesia or narcotics. There is a good chance your patient really might be devil possessed or cursed. You start every case with a really really sincere prayer for God’s guidance. The skilled nursing facility is a mat on a concrete floor. You are a woman in the men’s ward, or a man in the women’s ward. You got the good bed because it doesn’t collapse when someone sits on it. You got the good mattress because the mattress cover has a ratio of material to holes greater than 1. A “private room” means you pay 7 times the normal rate for an 8X8 foot cell with no ventilation. If you want to eat, you had better bring someone along to cook for you. You realize there are many things here worse than death. You start everyday really really praying to your God. You have had less control over your intestinal function than a 6 month old. You get to see miracles, just like in the Bible, every day. You get to meet and work with other missionaries from all faiths, who are the greatest and coolest examples of real Christians you could imagine. You get to have your faith tried every day. You get to live more than you have ever lived in your life. You really really start every day with prayer, like your life depended on it.